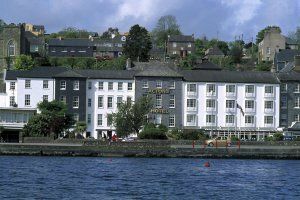 Douglas was re-designed in 1998 by Peter McEvoy. Douglas Golf Club is a beautifully maintained, very flat, parkland course, which is situated just outside of Douglas Village. 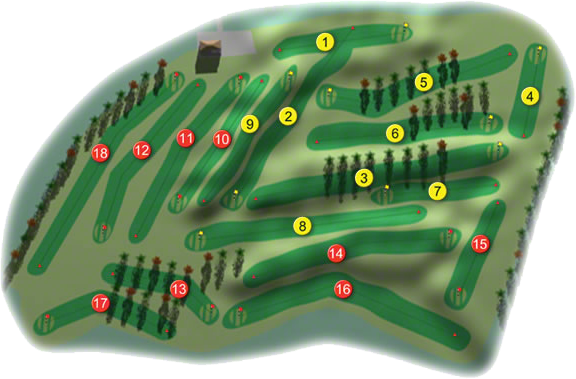 the Course was re-designed in 1998 with the intention of utilising additional land and of making the course more challenging for all and to allow it to be set up to challenge top players at all times. Consideration was also given to testing all handicap ranges and these objectives have been well and truly achieved. All green have been built to USGA Specification and the construction method has produced excellent putting surfaces with 12-month playing conditions. The views from the Clubhouse are some of the most panoramic in the country. 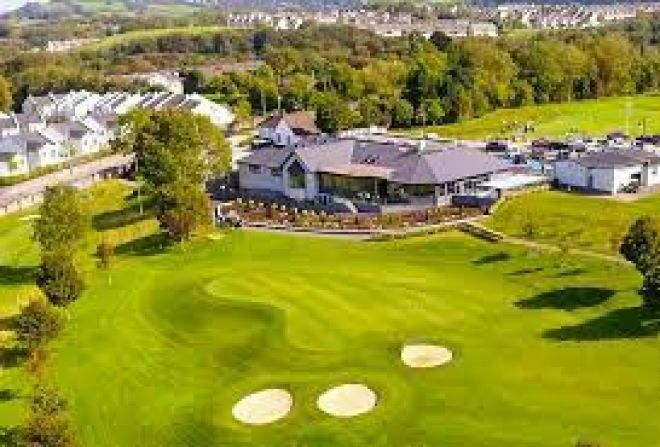 Douglas Golf Club has a reputation for being a very friendly club and visitors are assured of a "Cead Mile Failte" - however booking should be made in advance. It should be noted that Douglas is a non-metal spike course. The Ladies of Douglas Golf Club won the Munster Final of the Irish Intermediate Cup when they beat Dooks Golf Club by 4-matches to 1-match at Tipperary Golf Club on Sunday 2nd September 2018. They were led out by Jessica Kavanagh (16) who beat Caroline Breen (16) by 3 and 2, she was followed by Orla Coughlan (16) who had a 3 and 2 win over Jenny Pigott (17), next on the tee was Jill Morris (16) who had a 2 and 1 win over Angela Lyons (17), in the penultimate match of Mary O'Leary Cooney against Bridie Fitzgerald and bottom match of Helen Barry (20) against Delia Foley(18) were both halved when called-in. They made the long journey to Knightsbrook Hotel & Golf Resort to participate in the All-Ireland Deciders where they met Connacht Champions Bearna Golf Club in the All-Ireland Semi-Final on Thursday 27th September and recorded another 4-matches to 1-match over the ladies from Galway. They were led out this time by Jill Morris who had a comfortable 5 and 4 win over Imelda McGovern, she was followed by Jessica Kavanagh who beat Siobhan Smyth by 3 and 2, next on the tee was Orla Coughlan who beat Michelle Keenan by 3 and 2, in both the penultimate match of Mary O’Leary-Cooney against Nuala Timoney and bottom match of Helen Barry against Breda Davies were declared as halves when called-in. They met Ulster Champions Malone Golf Club in the All-Ireland Final the following day and they were led out again by Jill Morris who had a 1-hole win over Kay Gilbert, next up was Jessica Kavanagh who beat Claire Canning by 2 and 1, she was followed by Orla Coughlan who recorded a comfortable 4 and 3 win over Caroline Jones and with it the green pennant the two bottom matches of Mary O’Leary-Cooney against Anita Goan and Helen Barry against Sharon Cox were both declared as halves when called-in. Douglas Golf Club won the Munster Final of the Irish Junior Cup on 16th August 2015 at Dungarvan Golf Club when the beat Mitchelstown Golf Club in the Semi-Final by 3½-matches to 1½-matches in the Semi-Final and accounted for Ballybunion Golf Club by by 3½-matches to 1½-matches in the Final. They made their way to Carton House to compete in the All-Ireland Finals on 16th September, where they were drawn against Ulster Champions Greenisland Golf Club in the All-Ireland Semi-Final. First on the tee was Darren Hourihan who lost out to Andrew Ervine on the 19th, he was followed by Adam McSweeney who lost his match against Jamie Campbell by 4 and 3, next up was Philip Quinn who had a 4 and 3 win over John Armstrong, in the penultimate match John Boylan had a very comfortable 6 and 5 win over David Winning, in the bottom match Barry O’Sullivan- Geaney went to the 18th before relinquishing the point to Michael Hayes and a place in the All-Ireland Final. The Subs on the team were John O'Mahony, Brian Barry and Pierce Dorney, they were Captained by Derek Byrne and managed by Derek Byrne, Eavan Higgins and Stephen Hayes. Greenisland went on to beat Westport by 3-matches to 2-matches in the decider the following day, this was a very historic win for the Ulster Champions as it was their first green pennant in their 102 year history. Douglas Golf Club won the Munster Final of the Fred Daly Trophy and played Connacht Champions Galway Golf Club in the All-Ireland Semi-Final at Warrenpoint Golf Club on Thursday 28th August 2014. They were led by Daniel O’Sullivan who lost his match against Colm Hughes by 3 and 2, he was followed by Adam McSweeney who went down to Cathal Nolan by 4 and 3, next up was Pierce Dorney who had a 2 and 1 win over Peter Fleming, Barry O’Sullivan Geaney beat Paddy Culhane by 1-hole, John Boylan had one of those days when he lost his match against Michael O’Farrell by 7 and 6, the penultimate match of Darragh Lonergan against Mikey Burke went 3 and 2 to the boy’s from Salthill, the bottom match of Brian Barry against Sean Burke was halved. The Ladies of Douglas Golf Club were Runners-Up to Killarney Golf & Fishing Club in the Munster Finals of the Irish Senior Cup played at the Killeen course Killarney on Sunday 11th May 2014, when Killarney won by 3matches to 2-matches, but did qualify for the All-Ireland deciders at Mount Wolseley Hotel & Golf Resort on 15th and 16th August. They met East Leinster Champions Laytown & Bettystown Golf Club in the All-Ireland Quarter-Finals on the Friday morning and were led out by Kate MacCann who lost her match against Carol Wickham by 2 and 1, she was followed by Karen O'Neill who halved her match against Alison Taylor, next on the tee was Tara Gribben who lost out to Rachel Taylor by 4 and 3, in the penultimate match Eavan Higgins had a convincing 6 and 4 win over Phil O'Gorman, in the bottom match Edel Coyne lost out to Barbara Cooney by 6 and 5. Laytown & Bettystown did go on to win the pennant for their second time when the beat Killarney by 4-matches to 1-match on the Saturday. The ladies of Douglas Golf Club won their 13th All-Ireland Final of the Irish Senior Cup at Malone Golf Club on Saturday 13th August 2011. They beat Castletroy Golf Club by 3-matches to 2-matches at Castletroy on Sunday 8th May and made the long journey to Malone Golf Club to compete in the All-Ireland deciders, they were drawn against Connacht runners-up Roscommon in the All-Ireland Quarter-Finals on Friday 12th August. First on the tee was Karen O'Neill who beat Anne McCormack by 4 and 3, she was followed by Eavan Higgins who went up the 19th before securing the point against Ruth Lennon, next up was Kate MacCann who beat Mary Seymour by 3 and 2, in the penultimate match Ailish Thompson lost out to Paula Quinn by 4 and 3, the bottom match of Aoife Lane halved with Julie O'Gara when called in. They met Mid Leinster Champions Enniscorthy Golf Club in the All-Ireland Semi-Final the following day, they were lead again by Karen O'Neill lost he match against Aisling O'Leary by 4 and 2, she was followed by Eavan Higgins who beat Ciara Sharkey by 4 and 3, next up was Kate MacCann who had a comfortable 6 and 4 win over Jennifer King, in the penultimate match Julie Coyne had a 5 and 3 win over Margaret Mooney, the bottom match of Aoife Lane halved with Connie Doyle when called in. On the Saturday the All-Ireland Final was to be decided between Connacht Champions Claremorris Golf Club who beat Kilkenny Golf Club in the All-Ireland Quarter-Final by 3-matches to 2-matches and Ulster Champions Royal Portrush Golf Club in the All-Ireland Semi-Final by 4-matches to 1-match. They were lead once more by Karen O'Neill who lost her match against Sarah Helly by 2 and 1, next up was Eavan Higgins who had a 3 and 2 win over Kung Fanning, she was followed by Kate MacCann who returned a 2-hole win over Kate Gallagher, in the penultimate match Julie Coyne beat Sarah Gallagher by 3 and 1, the bottom match was again halved between Aoife Lane against Emily McHugh when called in. 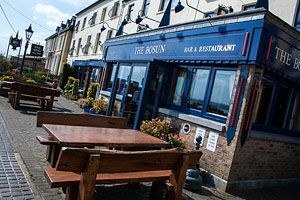 The Ladies of Douglas Golf Club were runners-up in the Irish Senior Cup at Cork Golf Club when they when they lost by 4½-matches to a ½-match against Royal Portrush Golf Club in 2010. They Mid-Leinster Champions Carlow Golf Club in the All-Ireland quarter-finals and recorded a 4½-matches to ½-math victory over them. They were led by Karen O'Neill who won her match on the 19th-green against Aedin Murphy, she was followed by Eavan Higgins who won her match by 1-hole against Karen Delaney, the next match was halved with Kate McCann against Anne McCormack, the penultimate match of Aoife Lane was a 2 and 1 win over Bernie Cox, in the bottom match Ailish Thompson had a resounding 9 and 8 win over Madeline Brennan. They met Laytown & Bettystown Golf Club in the All-Ireland Semi-Final whom they beat by 4-matches to 1-match, they were led again by Karen O'Neill who had a 2-hole win over Alison Taylor, she was followed by Eavan Higgins who beat Carol Wickham by 1-hole, next up was Kate McCann who also had a 1-hole win over Phil O'Gorman, the bottom two matches of Aoife Lane against Barbara Cooney and Ailish Thompson against Noeline Quirke were halved when called-in. In the afternoon they met a very strong team from the Royal Portrush Ladies Club and once more they were led by Karen O'Neill who lost her match to Gemma McClenaghan by 4 and 2, she was followed by Eavan Higgins who lost her match by 1-hole against Charlene Reid, the match of Kate MacCann was halved Maura Diamond when called-in, the penultimate match of Aoife Lane went 8 and 6 to Lucy Simpson, in the bottom match Ailish Thompson lost to Helen Jones by 4 and 3, they were captained by Deirdre Buckley. Douglas Golf Club won the Munster Final of the Pierce Purcell Shield in 2009 and was drawn against Leinster Champions Corrstown Golf Club in the All-Ireland Semi-Final at Tullamore Golf Club in September. They were lead by Richard Lonergan with Kevin O'Sullivan who lost out to John Dowling with Tony Merrigan by 5 and 3. They were followed by Michael Lucey with John Scannell who had a convincing 5 and 4 win over Nicky Hubbard with Jim Lowe. Next up was Eddie Cogan with Frank Walsh who recorded a 1-hole victory over Jarlath Beagan with Gary Began. Things were looking good for the Cork men but Tony Barry with Paul Herlihy lost out to Gerry Finnerty with Fran Lawlor by 3 and 1 in the penultimate match. So the passage to the All-Ireland Final went down to the bottom match of Frank Mackey with Philip O'Driscoll against Ciaran Conneely with Paul O'Kane when to the Dublin pair who won by 4 and 2 to book their place in the final against Letterkenny, the eventual winners. he Ladies of Douglas Golf Club won the AA Insurance All-Ireland Senior Foursomes at Royal Tara Golf Club in 2009, when they beat Carlow Golf Club in the Semi-Final and Ulster Champions Ballycastle Golf Club in the decider. They played Carlow Golf Club in the All-Ireland Semi-Final and won by 2 matches to 1 match, first up was Eavan Higgins (2) with Liz O'Donnell (10) who lost their match against Karen Delaney (1) with Madeleine Brennan (8) by 2-holes, they were followed by Karen O'Neill (3) with Deirdre O'Hanlon (10) who beat Anne McCormack (4) with Leigh Bolger (13) by the same margin, the bottom match of Kate MacCann (3) with Sabina Nagle (13) was a resounding 6 and 5 win against Bernie Cox (9) & Margaret McHugh. They played Ballycastle in the All-Ireland Final the following day, this time they were led by Karen O'Neill (3) with Deirdre M O'Hanlon (10) who won their match against Fiona Glass (12) & Paula Rooney (12) by 6 and 5, they were followed by Eavan Higgins (2) with Wendy Daly (14) who won their match by 4 and 3 against Brenda McNeill (12) & Rita McCormick (13), the bottom match of Kate MacCann (3) with Sabina Nagle (13) was halved against Mary Teresa McKiernan (12) & Susan Crawford (14). The Ladies of Douglas Golf Club won Munster Final of the AA Insurance Intermediate Cup and made their way to Royal Tara Golf Club in 2009 to compete in the National deciders, where they lost out to Ulster Champions Edenmore Golf Club in the All-Ireland Semi-Final the eventual green pennant winners. They were led by Liz Cronin (16) who lost her match by 2 and 1 against Colleen Hanna (18), she was followed by Ann Marie Horgan (18) who had a 2-hole win over Stephanie Watson (21), next up was Sally O'Riordan (19) who lost by 1-hole against Louise Gaw (21), the penultimate match of Ber O'Halloran (17) went all the way to the 20th-green before she lost to Zoe Allen (18), in the bottom match Rose Scanlan (17) brought Cherry Logan (19) to the 19th before conceding the point. The Ladies of Douglas Golf Club were runners-up the AA Insurance All-Ireland Senior Foursomes at Limerick Golf Club in 2008, when they beat Ulster Champions Shandon Park Golf Club in the Semi-Final and lost out to Mid-Leinster Champions Co. Louth Golf Club by 2 matches to 1 match in the decider. First on the tee was Kate MacCann (4) with Deirdre M O'Hanlon (10) who beat Julie Hall (6) with Diane Nickels (11) by 4 and 3, they were followed by Karen O'Neill (3) with Deirdre M O'Hanlon (11) who beat Jenny Young (6) with Karen Simpson (14) by 3 and 2, in the bottom match Eavan Higgins (2) with Claire Nash (13) halved their match against Diane Conway (10) with Vikki Simpson (11). They met Co. Louth Golf Club in the All-Ireland Final when they were led again by Kate MacCann (4) wit Deirdre O'Hanlon (10) who won their match by 2 and 1 against Jenny Gannon (1) with Jane McCabe (13), they were followed by Karen O'Neill (3) with Liz O'Donnell (11) who had a devastating 7 and 6 lose to Susan Mullaney (6) with Karen Yates (8), in the bottom match Eavan Higgins (2) with Claire Nash (13) lost by 5 and 3 to Deirdre Smith (+1) with Susan Kenny (15) by 5 and 3. Douglas where Runners-Up to Limerick Golf Club in the Munster, Senior Cup Championship at Lahinch in 2002, when they lost o n the 19th. The team was Karl Bornemann, Derek Byrne, Kieran Canty, Peter O'Keeffe, Michael Crowley, Tom Collins, J. P. Hughes, Cormac Finn, Aaron O'Callaghan, John Treacy and Kevin O'Sullivan. Douglas Ladies won the Munster section of the Ladies' Irish Senior Cup. They played in the All-Ireland Finals at their home Course from 7th to the 8th of September 2001. They were drawn against, Grange Golf Club in the All-Ireland Semi-Final whom they beat by 4 matches to 1 match. They meet Royal Co. Down in the final when they lost 3.5 matches to 1.5 matches. The team was Eavan Higgins, Kate McCann, Ailish Thompson, Aoife Lane and Clare Keating. Douglas won the All-Ireland Barton Shield at Malone G. C. in 1991, when the team was, Derek Maguie, Peter Morris, Don Coughlan, Denis Dudley, Don McFarlane, Sean Curtis, Kieran Canty, they were managed by Donal O'Herlihy. Douglas Golf Club won the Munster Final of the Irish Senior Cup and Barton Shield in 1995, when the team was, D. O'Herlihy, K. Bornemann, P. Morris, D. Coughlan, C. Canty, D. Maguie, J. Morris Jnr. they were captained by B. Kelleher. The early records of Douglas Golf Club were lost when the Clubhouse was burnt down during the Civil War. It is understood that it resulted from a blunder in interpreting the order. Anyhow, the members stepped in and contributed £735 to rebuild the clubhouse, which reopened in May 1923. The "Irish Field" on 1st May, 1923 tells us "Douglas Golf Club was started as a limited liability company by Mr. Arthur W. Winter, Mr. J. J. Brown, Mr. P. Morrogh, Mr. W. Morrogh and Mr. Guest Lane. The first Hon. Secretary was Mr. M. W. Litton. Credit is given to Mr. M. English for being the guiding spirit of the club for many years. When the club was formed there was land enough for only nine holes, which were laid out by Harry Vardon, and as well as can be remembered the nine holes were played until May, 1911, when the 18 were constructed"